FILE - This December 1959 file photo shows New York Knickerbockers' Richie Guerin (9) and Syracuse Nationals' Connie Dierking (20) during a basketball game at Madison Square Garden in New York. Dierking has died at 77. His death was announced Monday, Dec. 30, 2013, by WKRC-TV, where his daughter Cammy Dierking is a news anchor. Dierking had been a 1958 first round pick of the Syracuse Nationals, and also played for the Philadelphia 76ers and San Francisco Warriors for more than a decade in the NBA. CINCINNATI (AP) — Connie Dierking, a longtime NBA player who was part of the trade that brought Wilt Chamberlain to Philadelphia, has died. He was 77. His death was announced Monday by Cincinnati’s WKRC-TV, where daughter Cammy Dierking is a news anchor. It was confirmed by the University of Cincinnati, where he starred in the 1950s. WKRC reported that Dierking fell in November. No other details were released. The Brooklyn-born Dierking played with Oscar Robertson for the Bearcats in 1957-58. He later teamed with Robertson and Jerry Lucas on the NBA’s Cincinnati Royals. Dierking averaged 10.0 points and 6.7 rebounds in his NBA career. He averaged a career-high 16.7 points in 1969-70 for the Royals. 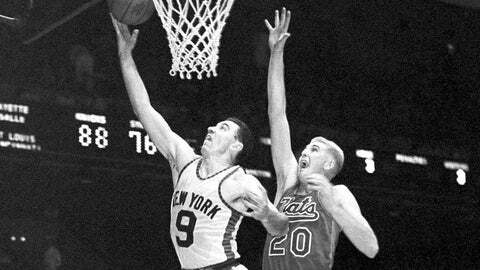 The 6-foot-10 center was a 1958 first-round pick of the Syracuse Nationals, who became the 76ers. He also played in the short-lived American Basketball League during more than a decade of professional basketball. In 1965, he was among three players traded to San Francisco to bring Chamberlain to Philadelphia, a move that helped the 76ers build an NBA champion. Dierking was later traded by the Warriors to the Royals. After retiring, he did color commentary on Bearcats games in the 1980s. Dierking is survived by wife Robyn and five children.